My Comments: Wow! A monthly payment every month for the rest of your life! How good is that? Despite the caustic rhetoric filling the air waves, causing turmoil and worry, I very much doubt there’s going to be any drastic changes to Social Security. Some loud voices want it to be abolished, but there are more loud voices saying it will stay. The demographic pressures now putting a strain on the system by the baby boomers will diminish as we die. There will be a gap until our baby boom children start reaching the system. It happened before and was more or less fixed in 1983. I suspect there will be another fix like the last one. Yes, this was written almost two years ago but the analysis is still valid. Social Security has provided much-needed benefits to generations of Americans, both when they’ve become disabled and when they retire. Demographic shifts have put financial strain on the program, and well-publicized outlooks for Social Security show key sources of funding running out within the next 15 to 20 years. It’s therefore not surprising to hear many people talk about the death of Social Security as imminent. It’s true that Social Security faces financial challenges and that lawmakers need to look closely at the consequences of making no changes to the current system. However, the alarmist notion that Social Security will go away entirely isn’t supported by the facts. That won’t necessary make the transition any more comfortable for those affected by it, but it’s important to avoid hyperbole and fully understand the current condition of Social Security and where it’s headed in the years to come. The 2016 Social Security Trustees Report last summer gave a snapshot of how the Social Security system’s finances were at the end of 2015, and the status of the program was better than many people realized. When you look at the combined balances of the trust funds for Social Security retirement, survivor, and disability benefits, the amount available was $2.81 trillion. Moreover, when you consider all of the income sources that the program has, Social Security’s trust funds actually brought in more than they paid out for benefits. As a result, the total balance of the trust funds rose by $23 billion for the year. However, the Trustees Report did show signs of the steady deterioration of the program’s annual surplus. The trust funds relied on more than $93 billion in interest payments from the U.S. Treasury to cover all of its benefit expenses. Payroll tax contributions left a shortfall of more than $90 billion, and the $32 billion that the IRS collected by taxing some Social Security recipients’ benefits couldn’t close the gap by itself. The more troubling trend has come from the rise in benefit payments. Total expenditures rose at a 4.4% annual rate in 2015, and that exceeded the 4.1% rate at which revenue for the program grew. That 0.3 percentage point difference might not seem like much, but when you’re talking about amounts in the $800 billion to $900 billion range for revenue and outlays, even small percentages add up to big dollar amounts. Preliminary figures for 2016 showed the trends continuing. Revenue of $957 billion exceeded payouts of $922 billion, but it took $88 billion in interest to keep the trust funds balance moving higher, reaching nearly $2.85 trillion for 2016. 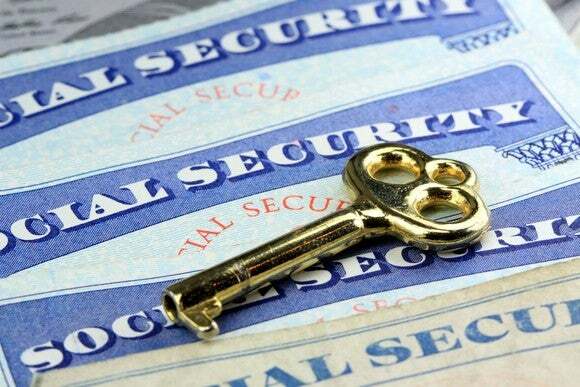 What’s coming down the road for Social Security? Given the current demographic trends, you can project how Social Security’s trust fund balance is likely to change in the coming years. Based on current projections, the trust funds should keep moving higher until 2019. After that, even the interest on the trust fund balance won’t be enough cover the shortfall between revenue and benefit payments. Over time, that shortfall will increase further, and the full depletion of the trust funds will likely happen in 2034. Yet there are two reasons not to panic about Social Security. First, the consequences of failing to address the depletion of the Social Security trust funds don’t include the complete shutdown of the system. The Social Security Trustees estimate that in 2034, there will be enough revenue from payroll taxes and other sources to pay 79% of projected benefit obligations based on current law. Granted, a one-fifth cut in benefits will be painful for many Social Security recipients, but it won’t be the catastrophic disappearance of monthly checks that many seem to see happening. More importantly, there are fixes that can help Social Security dig its way out of its current difficulties. The bipartisan Committee for a Responsible Federal Budget recently created an interactive tool letting people explore different ways to reduce the costs of the Social Security system going forward, weighing their likely influence on the program’s long-term shortfall. Among those fixes are measures that would increase revenue or reduce benefit expenses. Proposals for reducing benefits include the means-testing of benefits for wealthier retirees, raising the retirement age, or modifying the way that retirees get inflation adjustments to their benefits. Revenue-enhancing measures include increasing the amount of wages subject to payroll taxes or making more Social Security benefits subject to income tax. In addition, the potential for investing trust fund assets in ways other than through special fixed-income Treasury bonds could also potentially produce more money for Social Security — albeit at greater risk. Each individual solution only does a portion of the work necessary to close the Social Security shortfall. Taken all together, however, these solutions could leave Social Security in a better position to maintain a healthier level of benefits for current and future recipients. Social Security’s future financial status is uncertain, and action is necessary to address its current situation. However, don’t leap to the conclusion that Social Security is on life support. With worst-case scenarios that aren’t as bad as some fear, and that should make people more confident that with relatively modest changes to the program, Social Security can be preserved for generations to come.